I like 11 Maths B. Today I sat in on 2 maths classes, one a grade 10 maths class and one a grade 11 Maths B class. Both classes followed a similar format of theory followed by exercizes, but the difference between the two classes were striking. Once the individual exercizes began in Grade 10, it didn't take long for the noise level to rise. Most started out on topic but eventually the conversations swung off topic as the level increased. In grade 11, the silence was deafening in contrast. Why is that? Why would the year 11's be able to go immediately to the set task? I asked Bernie after the session and the answer seemed a combination. Firstly it usually doesn't happen like that. Absolute silence is still something to cherish. Second, Bernie moves into work faster and there is an air of expectation that everyone is keeping up. That probably only works because of the third point: they want to be there. You don't do Maths B if you're not enjoying it (or at least know you can do it). That's the reason I want to teach senior only. The kids are there because they want to be. 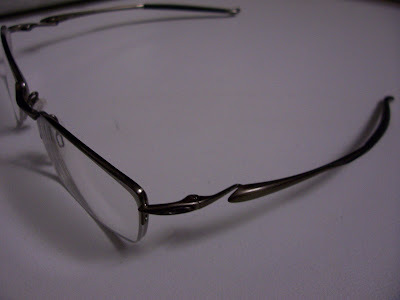 It's time for a new set of glasses. My old set have had a good run. They're light, rimless, and sit close increase visibility through the smaller than average lense size. They are also 7 years old and browning off as the transition lenses lose their transitionness. Transition lenses have been great, my 3rd set of glasses with that technology. it keeps getting better each generation, but they all seem to die the same way; they eventually end up brown. Some of the coating on the legs had peeled too, as well as a thin coating over the lense itself. The coating wasn't the transition part as they still retain the same level of brownness across the whole lense, but the ridgeline of the coating failure is starting to get into my general field of view. K.Rudd also stepped up to the plate and offered another incentive to get new glasses. $900 would do nicely. I headed in to OPSM through the school holidays and got the checkup done. Almost the same prescription as last time. My eyes haven't changed? I'm stunned. I don't treat them very well and even the day of the eye test was off the back of an all-nighter. They must have appeared bloodshot looking into them. Rummaging through the options for a new set, there seemed to be less options on offer than usual. I liked my old set a lot, but sadly that model had long passed its manufactured lifetime and in its place were chunkier versions. Must be a retro fad. A set of Oakleys were looking the best of the bunch, and the legs had a weird steampunk look. The brand name was 'Transistor'. Could it be that geek cred had made it into the company famous for surfing coolness? 2 weeks later an SMS alerted me to the arrival of my new glasses. I was a little disappointed that they sit a bit further out than my other set, but a couple of adjustments and they feel Ok, albeit a little disorienting for the first couple of hours. 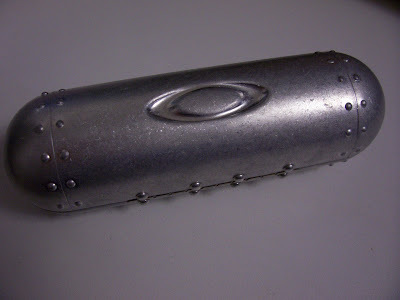 Arriving home I showed Sandy the Coupe de grace; a cylindrical metal container with pop rivets. Steampunk it is. Raph Koster drew attention to an interesting model of play where it is always assumed that play is an interaction between participants (either people, virtual characters, or mindsets). The complete model is a little overwhelming, but the buildup of the model is well worth a read. The cycles have me a little confused though. The cycle of play has only action / observe / assess / plan / action between the entities. From the model proposed this would therefore be actions in the absence of the conversation, engagement and ultimately fun. Can play exist without those? It would seem that the buildup of the model of play was to advocate fun through engagement, so without these elements the cycle of play doesn't make sense. On the other hand, the cycle of fun seems to run through action / conversation / shared world / engagement / fun, but doesn't include observing and reacting to other actions. Can you have a conversation or a shared world without the actions and reactions of both parties? The cycle of learning is interesting in its elimination of fun and in turn preferring to end the engagement to reflect and absorb the activity into experience. With a lot of emphasis placed on engagement as a highly desired attribute for the classroom, it seems odd that the engagement would need to end for the learning to begin. I can see that they are trying to describe the reflective process of learning, but is that all there is out of a play environment? The cycle of repeated play seems sad. Without fun, experience or goals, repeated play is like being stuck in a rut. I hope I never get to experience that. I'd really like to see some examples of what Dubberly Design had in mind for each of the cycles. What they are and what they are not. It seems to be an interesting model for looking into how to make games (and classes!) more engaging, or to diagnose what caused a lack of fun. I just finished my first prac with the grade 10's on games programming and I'd hurredly copied down this model before rushing to class. I didn't get to it (took too long talking about good games vs bad games and distilling attributes), but I'll keep it in mind for a pep talk 1/2 way through the term. Nice little video about knowing what you want out of life. CQU is going through a little debate on the merits of hosting a new LMS either inside the campus, or externally with another organization. This has led to Mahara ePortfolios along with the current moodle implementation being hosted off-site. I've also been going through this quandry as Personal Learning becomes more and more clear to me. I've been rebuilding a moodle site here at St.Luke's for use next term while I'm teaching, but should it be here? Should I be encouraging the kids to set out their own personal environment that they can keep forever? OLDaily pointed to Terry Anderson's article regarding My place or yours? A look into the same problem. I'm leaning toward the front yard approach. I believe it's the institution's responsibility to provide an environment for learning, and the investment in retaining past students within the same system (but accessing different resources) for lifelong learning provides an enduring advertisement for that institution. As more and more educational bodies move toward an open virtual environment devoid of buildings to mark their presence, the affiliation toward an institution through the daily support of resources and links back to previous material is essential. Scaffold the day from weaker skills to excelling skills. - Retaining some level of same-age courses: Since the students at the start of the day are all taking their relatively weaker skills, they would all more likely end up in a classroom with age-alike students rather than a hodge-podge of student ages. I'm still digging to see whether there are any real ramifications to having only merit based entry into sessions with no age based grouping at all. It would seem that schools are flipping between streaming and integration with no real winner so far, and since that PLEs through VR would be an aggressive streaming process I'll need to dig into all the different reasons why age based integration is still advocated. Hopefully it's more about the diversity aspect (that PLEs through VR will have in spades) and not the same-age traits. If there are any same-age issues then hopefully structuring the day in this manner will limit their impact. - emphasized goal setting: The skill trained in the last session would be a peak skill, one that the student is excelling in. Those peak skills are more likely to have entry requirements further down the skill tree that the student has not yet attained, the 'ridge skills' of the mountain. These ridge skills would also have requirements of other skills further down the ridge until you finally reach a valley of skills not yet know, but required to advance the peak further. Ideally the valley skills attained in the morning enable ridge skills for the middle session, then enable a new peak skill. This would build a direct causal relationship between studying the skills that they may not like by giving them direction as to how those skills build into something they do like. Not to easy, not too tough: A difficulty level for Education? After listening to the latest Brainy Gamer podcast, the topic of setting difficulty level came up as a balancing act for engagement. Too hard and the player gives up in disgust and doesn't enjoy it, too easy and the game is boring with no real rewards. Michael brought in Jesper Juul's Fear of Failing article as a baseline for difficulty setting in modern computer games. It struck me, though, that this kind of engagement through difficulty settings could also help in the broader educational environment, and would be greater achieved through personal learning environments. Jesper quotes Falstein's work in that difficulty progression isn't just a smooth path either, but comes in waves as the player experiences failure, then adapts and leaps back into success. Maybe little 'Aha' moments all along the journey? I'm drawn to my experience in World of Goo where each level builds on the skills of the previous level, but is not attainable by those skills alone. The problem remains interesting because there is a subtle tweak in the mechanics to allow progression. The engagement comes in finding those tweaks, experimenting with them, and building them into your repertoire for the next level. Could education be like that too? It smacks of self-directed learning where the student is encouraged enough to seek out answers to the problem by themselves. Maybe the last few questions in maths class should be lead-ins to the next topic? Using previously learned skills COULD get you there if you tweaked the mechanics enough. What happens to those in the class that don't get it? Doesn't seem to fit the teacher-centric model where everyone needs to be at the same level. There is always one strategy that can be used over and over; wait for the teacher to tell you the answer. When looking at PLEs though, you have the flexibility of delivering the content to people in an individual way so that they can all keep 'in the channel'. Understanding just how much failure is required to make the material engaging would be very appropriate. 'How much failure' is probably the wrong phrase. It's not the measure of intentional failure (you don't set the curriculum to purposely make people fail), but the perceived failure that increases engagement. As long as you know you could have failed. Reminds me of an adage from Sim Golf: "A golf course should look hard, but play easy". The little sims would enjoy the sight of lots of water in front of them, but hate it if the ball went in the drink. A little water or sand placed in the hit-over zones breaks up the course into achievable chunks that made the sims feel challenged, but remain happy. Failure count = number of fails. Failure communication = ease of identifying why you failed. Failure setback = how much time and energy the failure cost you. Failure repitition = how much the task needs to exactly repeated again. Failure communication = Teacher's / curriculum's ability to highlight to the student exactly where they went wrong. Failure setback = How much time and energy wasted on repeat attempts. Failure repitition = Whether or not different examples can be used to demonstrate the skill. Failure also needs to be looked at with a positive attitude. Juul warns against learned helplessness (through attribution theory) where the attitude of the person turns pessimistic. Instead of seeing it as a challenge, they see it as a personal failing. Instead of attempting to do better next time, they give up. Instead of accepting that they may be underperforming in only one area, they see it as total failure. It looks like the psychological effects in an educational context are more grounded, so hopefully that won't be an issue to tackle just through PLEs. Falstein, Noah. 2005. "Understanding Fun—The Theory of Natural Funativity". In Introduction to Game Development, ed. Steve Rabin, 71-98. Boston:Charles River Media. Juul, Jesper. 2009. "Fear of Failing? The Many Meanings of Difficulty in Video Games" From Mark J. P. Wolf & Bernard Perron (eds. ): The Video Game Theory Reader 2. New York: Routledge 2009. pp. 237-252. EDIT: Found the original article that outlines the key points of the new system. When RSS first arrived on the scene I had looked at it and more or less rejected the technology as it required a change from all websites to expose the content in the way the reader likes. There were (and still are) a number of reasons why a websites wouldn't want to have their content taken away from their method of delivery from an advertising point of view or even just a data silo point of view. Without the majority of sites on board, RSS for the user was more potential than practical. I did dabble quite a lot with RSS though, as a back end method of integrating websites together at a corporate level. Fast forward 5 years to the present and RSS is now more or less ubiquitous throughout the net wherever data is stored. I'd highlight Web2.0 companies as the main proponent for driving the technologgy forward as RSS enabled the mashup mentality. Maybe it was the the other way round? Maybe Web2.0 exists because of RSS? Regardless, RSS is definitely here to stay. During the GDLT I'd been following more and more blogs to do with education, and the more I followed the more sense an RSS reader made. Combined with a need to access these from more than one computer and from more than one location (Uni, home, school), I looked into Google reader as my catchall. It so happened that I came across a web post summarizing many thousands of votes as to what the most influential web2.0 technology was for personal learning environments. Google reader was in the top 3, along with Delicious (another web2.0 tool I'd started up with due to multiple locations). An RSS reader? What are they doing with an RSS reader as an educating tool? I could immediately see the benifits in Delicious being up so high if you had a network of friends/associates/peers to share links to. In fact I used it as the framework for a collaborative WebQuest. But RSS? Most of the uses I could think of would add to the experience, but not be at the centre of it. After around 6 months of use, Google reader became more and more part of my daily routine. I'd also search out an RSS feed on a page rather than bookmarking it in delicious. There were so many feeds that I started to metatag, like "_critical" for blogs I really must check every time I open the reader. Google reader was also the starting point on many a journey through the web. I'd read something interesting and kick off into a new search down that rat hole, or followup with a comment, that then led to more conversations and ideas to keep track of. Looking back one day I noticed that the change in the way I use Google Reader came from the types of people I was subscribing to. Since it stemmed from investigation through the GDLT and had a strong teaching and eLearning bent, I had continued the mentality of subscribing to people that I thought were providing insightful articles that made me think. Even in topics far removed from the GDLT, my immediate reaction to hearing a good point of view would be to dig up the RSS and subscribe. By following people that make you think, most times when I'm starting the day with Google reader I'm confronted with new ideas and challenged to dig deeper or contribute. So to me the crux of the change can be summed up by: Follow smart people. That's how you take Google Reader and turn it into your very own PLE. Don't just follow the news and weather or your friend's Facebook feed, follow leaders in your field, follow the inspiring rebels, follow people you look up to and respect. By the time I covered Snowdon's Web 2.0 and Your Own Learning and Development I'd seen the light. David just made it all that much brighter and with amazing clarity. PLEs aren't just a fancy word for our students, it's us too. Personal Development. Lifelong learning. Here. Now. This year's GDLM 1st years are having to do a combined eLearning and Dimensions of Learning course, part of which is setting up an ePortfolio. I've offered to help tutor for the subject since I really liked the eLearning component last year and it's been pretty fun so far (albeit a bit lacking in time due to work commitments and my own assignments). I'd fiddled with a couple of the ePortfolio systems before, including the Mahara demo, and lamented about the lack of attribution that is currently on offer. I finally bit the bullet over the weekend and set up my own ePortfolio over at Netspot (CQU shadow system). After using the system for a while it seems a little easier to get around the interface, but the integration to Moodle is the closest thing to attribution I can see. Going to have to dig into how they are doing it to see if there's any fundamental point of validation that can be translated to other web groups/organisations. Mum & Dad came down last night for the Maundy Thursday service and mentioned the huge amount of traffic on the road over breakfast. Why is it that when there's lots of people on the road you always seem to get stuck in a massive lineup behind someone doing 80 on the highway? I lamented too that it's actually inconsiderate of the slow drivers to not pull over and let them pass. This builds on the 2nd of 2 driving principles: Be aware, Be Courteous. It suddenly struck me that you should be able to calculate WHEN you should pull over depending on the speed and number of people following. If you are trying to maximize the trip for everyone, then it's simply when the cost of pulling over is less than the loss of time by everyone behind. First, the cost of pulling over. I'd guess that 30 seconds would be a reasonable figure. That gives 10 seconds lost while braking, 10 seconds to let the traffic past, and 10 seconds to get back up to speed. I reckon I could get under way and get up to speed with a car 6 seconds away, so 10 should be comfortable. Second, the cost of the people behind. If the person in front was doing 90km/h and the people behind were travelling at 100km/h, the difference is 10km/h of lost 'time'. The ratio of current speed to desired speed difference is therefore 90km/h : 10km/h , or 9:1. So a 30 second loss in 'time' through difference in speeds therefore translates to 4 & 1/2 minutes of driving time by the lead driver. At 90km/h that would translate to almost 7kms of road. That seems reasonable. ~5minutes following someone over 7kms would have at least a couple of opportunities to pass. If someone was stuck behind me for that long I'd consider looking for ways to let them pass. Now lets look at someone doing 80km/h with 4 cars behind them wanting to go 100km/h. ~20 seconds before you are inconveniencing the people behind you more than the 30 second effort to get off the road. In other words, you're an inconsiderate driver if you don't pull over at the next opportunity. Keep in mind this has nothing to do with the amount of passing lanes, the amount of pull-in spots, whether you're going 80 and the guy behind only wants to do 90, it's purely about maximizing the journey of all participants. It's about being considerate of all travellers, not just yourself. I began to think how well it was constructed. The vision set up like blood gushing from a crushed Jesus, but it's not blood, it's sorrow. Sorrow for the people around him, sorrow for the disciples who have fled. And mixed with anger? No, Love. How could you still love when you're hung up to die? When the weight of the world's sin is piling up on your shoulders? I didn't get to sing the rest of the verse. I couldn't. When the slide changed to the final verse, I read ahead and found my voice. I needed to sing, to state the response that flooded me. EDIT: Found a Good Friday sermon based off the verse. Been tracking a particularly weird problem with the new A10's here at St Luke's: All seem to crash upon entering standby mode. An easy workaround was to turn off standby mode, except you can't do it as a normal user, so they all now have admin rights. Since it was also repeatable directly off Toshiba's XP downgrade disk, I poked around for a couple of weeks testing different combinations. Finally found a solution that's repeatable: Disable all network cards in management console, then reboot, then re-enable them again. No idea why that would fix it. I was on my way to enabling them one at a time to see if it was a specific card, but once all of them were enabled and the problem was still gone, I tested it again on the SOE image and it definitely works. This is awesome! Exactly what I'd been thinking crystallized into a neat package. I'm excited! I've been a little disappointed with the blackboard software used for the GDLT. It offers most of the things that I think I want (linkable content, discussion, grading, peer review), but somehow it does't deliver them in an efficient manner. On the flipside I've found that through more targeted use of RSS, Delicious, blogs and blog comments, I have grown my own network to research this eLearning phenomenon. Bring it on, focus on me! Interaction: For me I'm finding out that I'm more and more a social learner. I want to talk to people and I want to listen to their ideas. One of the courses this year had a tutorial session for on-campus students. The video of this session was far more approachable than the 3 weeks of reading about and around the subject matter, and made a lot of things fall into place. I felt jealous that I couldn't participate fully in a face-to-face session. Usability: I agree in general about things being useful if they are simple to use and reliable, but not really grabbing me yet. Relevance: This reminded me of a brief conversation with Ron on the way home from Shed Men tonight regarding how to do effective Google searches. Once you have built up a skill of effective googling (so that you almost always get the exact thing you were looking for as the top link on your search), it changes the way you treat knowledge into facts (retrievable) and application (mashup, analyse/reject alternatives, apply). Exactly! I want to learn, I crave learning. Face to face contact is the best method of getting someone's ideas and perspective from their mind to mine. When we communicate we are always on the lookout for feedback as to whether the receiver is understanding it, or whether you need to explain it from a different angle, or whether you can skip ahead to the next section. Greater interaction breeds faster communication. Lectures relying on a broadcast model is so true. It cuts down on the interaction, but I believe it elevates the human content. It allows the presentation of an idea in a prepared manner, rather than in a fluent conversation. You would hope that the preparation of the content makes it easier to transmit the original concept. I do see exactly what Stephen's talking about though; instead of relying on the content delivery from an educational institution, put in the effort to organize it around you. I've been feeling recently that my attitude to the GDLT course has gone through just this process. My notion of an academic institution used to be one of an authority without question. They are there to educate; You do the things they tell you to get the piece of paper. That was different to chasing up on my hobbies and interests, even if my hobby was closely aligned to the content at in the course. Placing yourself at the centre rather than the content means that YOU take charge of the direction of learning in the area of interest rather than the direction of the coursework. This difference becomes evident once the coursework is completed. If the content is at the centre of your learning environment then when you replace the content (to do another course) the rest of your learning network goes out the window with it. If you are at the centre of learning the topic, that network can remain even though the coursework is long gone. Life long learning here we come! Lots of tools to use for setting up your personal network. Most of them I use already to a greater or lesser extent. I think the key here is the purposeful use of the tools to create a learning environment rather than just a social medium. An example is RSS. I have used RSS in some form since it's inception, but mainly from backend processing. I knew of RSS readers and their capabilities, but never really found them to be all that useful because not every page supported RSS. This undermined the intention of a reader to be the main point of contact with the net. During last year I set up Google Reader to start aggregating websites I found interesting for the GDLT course. It took about 6 months before I noticed a change in my perception of Google Reader. Instead of being a tool to track websites for the course (since I was no longer doing that subject), it became a tool for tracking my areas of interest. The trick is to follow smart people that challenge you to think. This purposeful use of the technology transformed it from a tool for delivering content to you, to a place where I'm challenged to learn every day. To me this is the key to engagement learning. If you can convince someone that they need to seek out the answer, they are much more receptive when the answer is provided. Pull means they have a need for the information, whereas push may or may not hit the mark of what they were expecting to learn. I've certainly known for a long time that I can communicate more effectively face to face, or failing that, a phonecall. I've tried doing podcasts etc, but Stephen gives me more conviction that I should be trying harder to communicate via voice, especially recording voice instead of just sitting here typing it down. After Showing Sandy the first part of this article and illustrating how she could use web2.0 to construct a PLE around Digiscrapping, I also indicated that she could be recording her own thoughts about how she made each piece to potentially help others. In reply to the answer "That'd be too long! ", I thought that voice recording would be an alternative with a paragraph or 2 as a summary for the blog. Reflective learning and all that. I like the sentiment, but I think that a lot of people (like Sandy) feel that there's no point in sharing because nobody with find value in what they have to say. I know that when I started this blog there was no real desire to be famous or to publish, but just to get my thoughts down somewhere searchable (and to practice typing). It reminds of a quote I heard at the start of one of the subjects this year that "any data is useful if it can be managed" (searchable, taggable, mashable). Yeah baby! This is really the clincher for me. Why bother whinging about the lack of interaction on Blackboard when you could easily set up a wetpaint / wikispaces / ning group and launch off again. I think it's still a hangover from sitting back and expecting the Uni to take the lead. As a contract programmer there are some basic interface tenets behind these 2 elements. A good user interface shares a lot of the properties of communication tools because they are trying to achieve the same thing: to let the information flow. You should be able to intuitively do what you want, when you want. A good usable tool facilitates this, rather than getting in the way. Back to that quote again. All data is valuable once it is in a manageable form. Summarizing makes the data more valuable by providing even more context for searchability & mashability. Delicious does this with aplomb as it is trivial to tag multiple relevances according to what others have already tagged it, or your own personal take, or your own comments. It all depends on exactly what you want to remember it by / communicate it by and your care factor. If you don't care that much about tagging it's still dead simple to +d, click, click, click and you're done. All the effort of adding value is taken away so that it increases the perception of worth once you start relying on the data down the track. Ahahahahaha! My thoughts exactly. All the bits, but somehow it just doesn't work. Definitely a usability issue. Well, I certainly agree with the sentiment that a blog is simply a place for notes, but I think organized blogging also has its place. They've hijacked the medium and made it something different, but I don't think they are wrong in doing that. Never really used Flickr because the pictures I wanted to share are easier / more contextual inside a blog post. Didn't know that you can tag a photo specifically for CC use though, that might sway me right there. Edit: I take all that back, not only did I find Stephen's feed sitting on the main page, but subscribing wasn't working because it was already in my list kinda feel really foolish now. Google reader definitely comes into its own once you have more than around 50 feeds, but my unread postcount will forever stay at (1000+). I've even had to make a "_critical" tag for feeds that I absolutely must check each time I'm logging on, regardless of the different fields of interest that I have. I've had this urge to do almost exactly that. A couple of the comments and thoughtful discussions I've had have been in Blackboard forums. If I want to link to these now or refer to them 5 years later I can't because that information is locked up in a closed system. I'm in the process of putting together an ePortfolio and am keen on using it to replicate assignments / poignant discussions for future relevance. That or plonk it on here, which was my first thought before getting fired up on ePortfolios. I really don't like demanding, why not request it? Where'd common courtesy go? I'm a systems admin and if someone presented a valid arguement why they feel they need a certain technology then I'd most likely agree unless there are factors that they have not considered. Shadow systems and backchannels are all well and good, but demanding you purposely subvert the system is a little much. I'm dawning on the idea that the purposeful construction of your own network to follow challenging ideas is the key to self-directed learning. I know I'm self-directed in my own social network and I'm involved in formal learning, but this makes the link between the two for me. It's a little scary thinking that, as a prospective teacher, kids will demand what whey want to learn next. Does every child have the discipline to know what they want? To do the English studies instead of the ball sports? In my vision of a virtual learning environment, each student will have a learning manager assigned to them (guidance officer?) that helps them build a learning plan through the units available with the knowledge of parental desires, societal desires, societal needs and the kid's personal preferences. Not exactly self-directed, but as much self-direction as possible. Hopefully the upshot is increased engagement. If the student feels in control of their learning network, they are the ones looking for answers and ready to be lifted to the next level. We're now looking into e.Portfolios for the GDLT course as a way of documenting our learning journey and a step toward an ICT Pedagogical License. Scot has recommended Mahara, an ePortfolio system coming out of the New Zealand higher education system, or possibly WetPaint in a roundabout way. I want to be able to write a document about a certain topic and link it to my ePortfolio (either by directly hosting it in the ePortfolio system or linking to its original point on the net). I then want to make this artifact available for others in a group, or individually, or publically. Then I want others to be able to comment on the document, respond to the document with a document of their own, or rate the document (like a kudos in Slashdot). Rating relies on the authority granted to the person doing the rating. Anyone can rate anything, but the more influential the voter the higher its significance. If the document is for contribution to a group, the group moderator (or a consensus of the group) can give a group rating instead of an individual rating. This means that the group itself has attributed this article worth rather than an individual voice. This can be extrapolated to more and more official 'groups', such as submitting a document as an assignment for a University course with the course moderator (eg: lecturer / marker) attributing a rating on behalf of the course itself, or combining multiple grades from different courses to give a certificate by the University. As with kudos or comments, the ownership of the attribution stays with the originator. So if someone makes a comment on your document they still retain ownership of those comments, but grant the recipient the right to display that comment alongside the article as an attached artifact. Even giving a rating is still attribution and retains the ownership to the rating giver, but transfers the right to display the attribution alongside the document. Collected ratings could also be used to develop another view demonstrating achievement in a certain discipline. Instead of writing up a Curriculum Vitae as a static web page or a collection of personally typed text, each achievement is automatically able to be validated by following the attribution back to the giver. Even if the attribution is a summary of multiple achievements, it should be possible to provide a view to those achievements built by the summary maker, giving a chain extending right back to the material that demonstrates each facet of the overall achievement. With an expedient method of attribution and an easy method to validate the attribution givers, you could construct a framework of course units where each unit requires a set of demonstrated skills for acceptance, and provides a set of demonstrated skills once completed through attribution. Once an established framework of units are tied simply to the existence of demonstrated skills, it allows multiple units to operate in parallel to deliver those skills, but potentially change the method of delivery. Imagine a unit for trigonometry where it is designed with graphs and diagrams aimed at visual learners running alongside another unit with a more verbal, story centred approach. Both could deliver the same demonstrated skills (achievement in trigonometry) but give the learner the flexibility of choosing their preferred path of learning. If, through the course of one unit the student is creating artifacts that demonstrate another discipline, those artifacts can be presented through another view as prior learning evidence once they take on the new discipline. Although it may seem that the authority required for official attribution would be prohibitive, the ability for anyone to grant attribution means that more can be done with peer relationships and semi-authorative sources. Peers in the same unit would be encouraged to comment and rate other people's documents as part of a reflective process. These peer ratings can help guide an authorative source, or even provide enough weight on their own for unit completion. People who have already completed the unit confer more credibility with their rating, which gives rise to a mentor / tutor position of attribution. This not only helps the pupil, but may establish an easy channel for people to become authorative sources in their own right. Through correct ratings and comments, a mentor can demonstrate a higher level of critical thinking that can in turn gain attribution of excellence in the subject. Attribution by anyone also opens up the possibility of groups with no known authority developing their own layers of authority through meritocracy. An example of this would be Flickr where, through attribution, people's photos are ranked in many different ways. If someone gains a following through good photos, they can carry more authority when attributing a positive comment on another's photo as many more people will also then look at that photo. At a layer up, groups have spontaneously formed where their authority is purely on the strength of the service they provide to their members in finding pictures that fit the group's criteria. Somehow this ePortfolio system mashed its way into my vision of virtual reality. I guess that's a good thing as I've been wondering what the first steps could be to implement such a system. As a starting point though, I feel it's definitely worth the time collating all the documents, blog posts, web sites & videos that I have been given official attribution for already (read: Uni assignments). I doubt I'll be able to get the original attributers to give a digital attribution, but I could make placeholder artifacts until that day arrives. Nice that it's an Aussie touch. I particularly like the look on the guy's face in the testimonials: "Bloody brilliant. I was out during lunch, kicking with my mates and I let a couple rip from 60 metres out. The gBall vibrated and I've now got an agent."